Pluto's relationship with its moon Charon is one of the more unusual interactions in the solar system due to Charon's size and proximity. It's more than half of Pluto's diameter and orbits only 12,000 or so miles away. To put that into perspective, picture our moon three times closer to Earth, and as large as Mars. A new study from the Georgia Institute of Technology provides additional insight into this relationship and how it affects the continuous stripping of Pluto's atmosphere by solar wind. When Charon is positioned between the sun and Pluto, the research indicates that the moon can significantly reduce atmospheric loss. "Charon doesn't always have its own atmosphere," said Carol Paty, a Georgia Tech associate professor in the School of Earth and Atmospheric Sciences. "But when it does, it creates a shield for Pluto and redirects much of the solar wind around and away." This barrier creates a more acute angle of Pluto's bow shock, slowing down the deterioration of the atmosphere. When Charon doesn't have an atmosphere, or when it's behind or next to Pluto (a term scientists call "downstream"), then Charon has only a minor effect on the interaction of the solar wind with Pluto. The study's predictions, performed before the New Horizons probe collected and returned data to Earth, is consistent with the measurements made by the spacecraft about Pluto's atmospheric loss rate. Previous estimates at the time of the study were at least 100 times higher than the actual rate. John Hale is the Georgia Tech student who co-led the study with Paty. He says the Pluto system is a window into our origins because Pluto hasn't been subjected to the same extreme temperatures as objects in closer orbits to the sun. "As a result, Pluto still has more of its volatile elements, which have long since been blown off the inner planets by solar wind," Hale said. "Even at its great distance from the sun, Pluto is slowly losing its atmosphere. Knowing the rate at which Pluto's atmosphere is being lost can tell us how much atmosphere it had to begin with, and therefore what it looked like originally. From there, we can get an idea of what the solar system was made of during its formation." 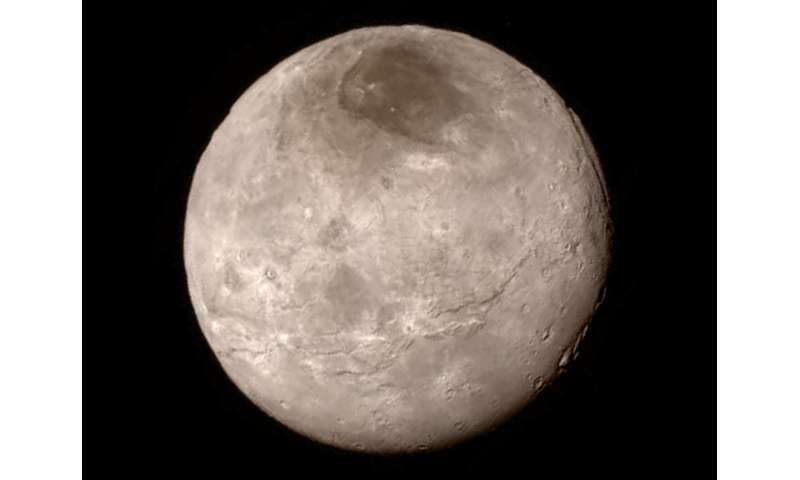 Hale and Paty also say their study affirms a popular hypothesis of Charon. The areas of discoloration near its lunar poles are likely caused by magnetized particles that have been shorn from Pluto's atmosphere. These particles have accumulated and settled on Charon over billions of years, particularly when it is downstream of Pluto. Nitrogen Melting point -210.00 ° C; Boiling point -195 795 ° C.
Pluto Surface temp. min. -240 ° C (33 ° K); atmosphere: Nitrogen, methane (-182.5 ° C / -161.49 ° C), carbon monoxide (-205.02 ° C / -191.5 ° C). Removal atmosphere is exclusively due to low temperatures and the conversion elements and compounds in the solid state. Other claims are for not connoisseurs of physics.